A Milken National Educator Award recipient, Margo Sorenson is happy to speak to young readers, community groups, and educators. She has presented to school children of all ages, to teachers through in-service workshops and graduate studies, and to numerous community and service groups, and is delighted to help with their fund-raising. She enjoys sharing the development of her books, including childhood influences on her writing process, the ways in which she generates story ideas, as well as the plots and characters which make her books appealing to readers, and the importance of revision—sharing her more than 50 pounds of rejection letters! She will tailor talks and workshops on writing specifically for each audience and welcomes pre-presentation input. Margo says it’s fun being “deep cover” for teachers who have objectives they want reinforced for their students! 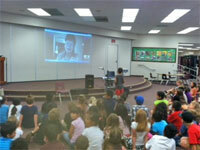 Margo is available to visit your classroom, library, or book club by Skype. For regular Skype sessions longer than 20 minutes, for fees and availability. 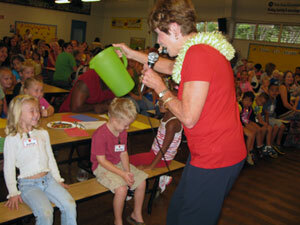 A full-day school visit includes four one-hour presentations plus autographing. The fee is $1,000, with half-days available. School site visits may be shared. Writers' workshops are $300 per hour; library, community speaking engagements, and classroom visits are $250 for a 45-minute session. You may contact Margo for more information and other available options.